Hello, everyone! I'm back on night shift for a few weeks, so pardon me if I'm a little quiet on the blog for a bit while I live the zombie night life. Sooooo tiredddd! We're meeting some friends for some St. Patrick's day festivities tomorrow, so I've been on the hunt for something to wear. We've had these plans for a while, so I started the hunt early. Apparently, it's tough to find green too far in advance. 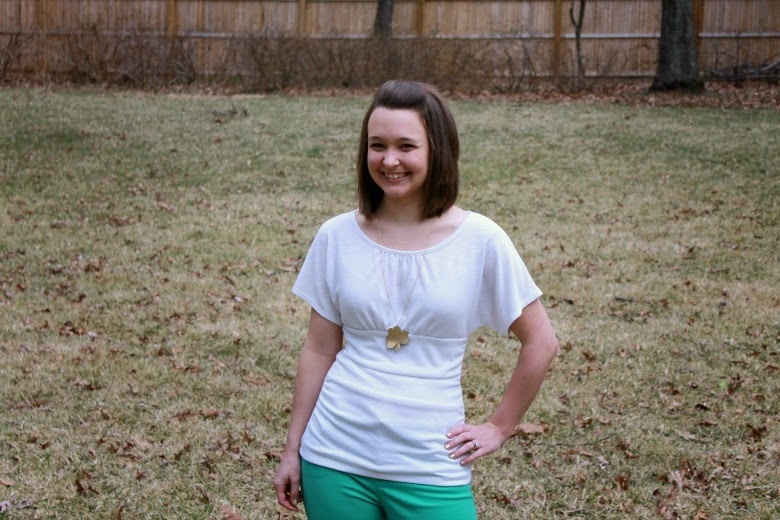 I did eventually find some mint green pants, but even as it got closer, I couldn't find any festive jewelry!! 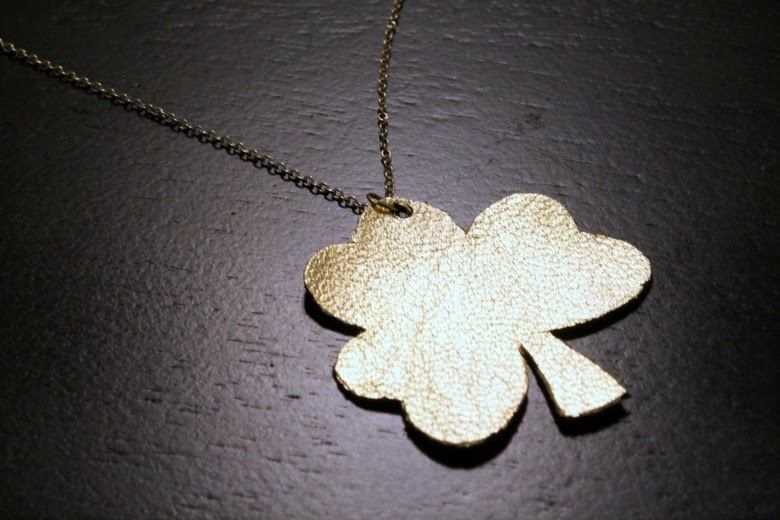 All I wanted was a simple gold chain with a shamrock on it. 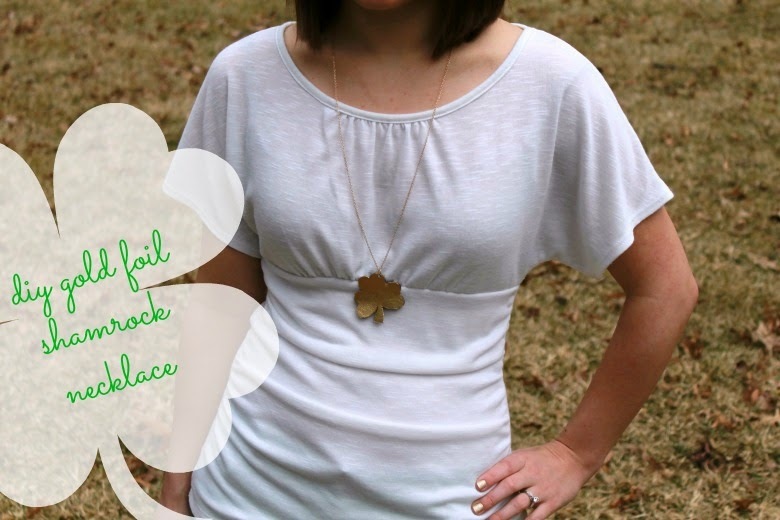 I would have taken any clover themed jewelry though! But I couldn't find anything. So naturally, I decided to attempt a DIY! So today, very last minute, I went out and bought a random gold necklace at Kohl's for $11. You could also buy some chain at the craft store to make it whatever length you want. Michael's was right next door, so I headed over to pick up the rest of my materials. First, I printed out a clover template which I found at Everything Etsy. I couldn't decide what size what best, so I used them all! 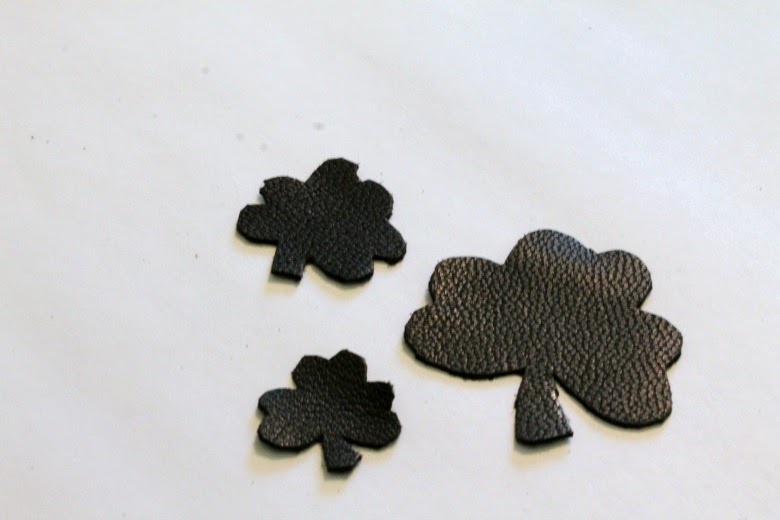 I cut out the shapes and traced them onto the back of the leather. Next, cut the shapes out of the leather. Turns out, it's hard to cut leather!!! Look at the poor clover at the top! Use your sharpest pair of scissors! 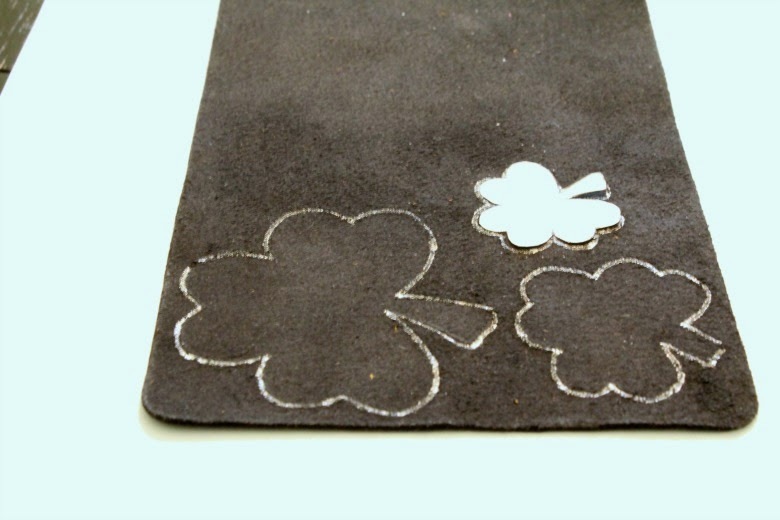 Next, I used the adhesive pen to cover the front of the clovers. Let dry 5 to 10 minutes. 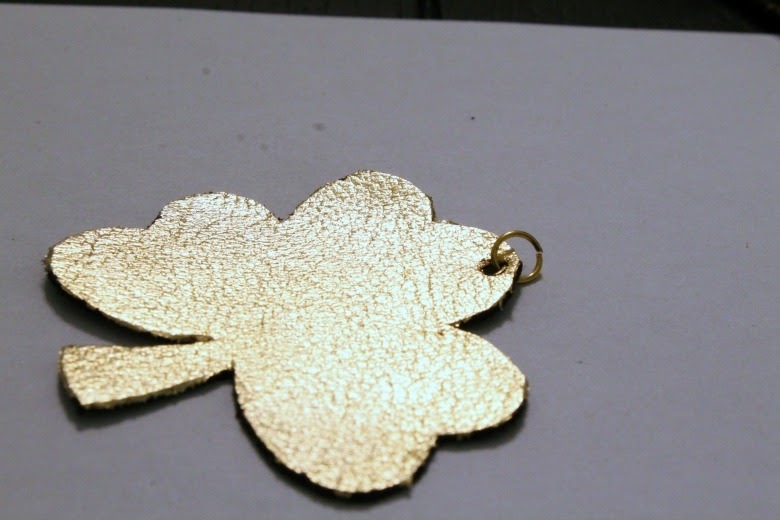 There are other adhesives available for gold foiling, but I thought this seemed the easiest. 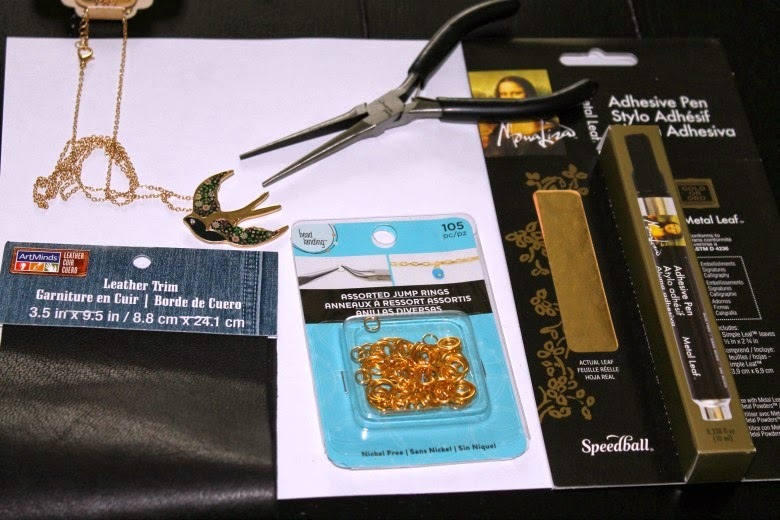 And it was cheaper to buy it as a kit together instead of buying the adhesive and gold foil separately. 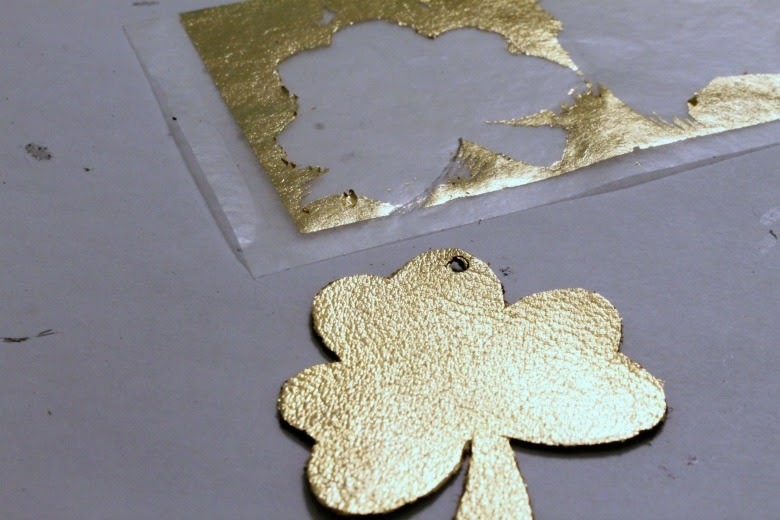 Once the adhesive dries, press the sheet of gold foil onto the clover. Smooth it out so that there are no bubbles. Carefully brush away the excess foil. I used a small paint brush to smooth out the edges of my clover. 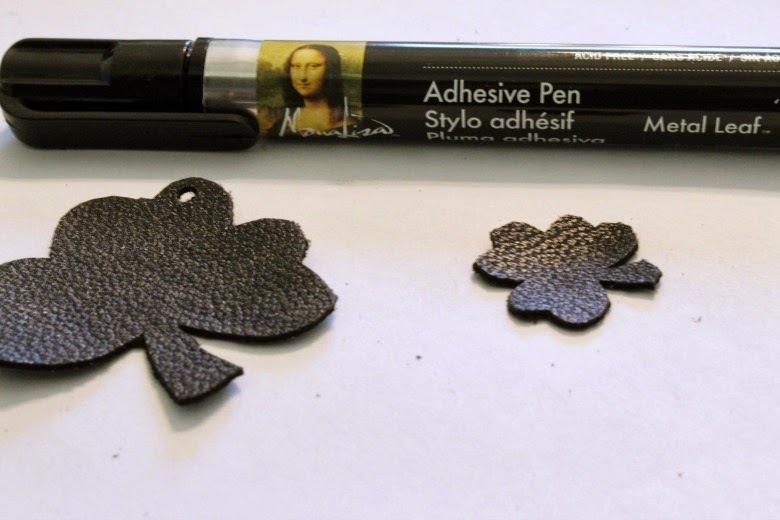 Use a small hole punch to make a hole in the leather. Then, use pliers to insert and close a jump ring. I love this, although I don't usually wear gold (I might make an exception for St. Patty's day). Would an x-acto blade work to cut the leather? I don't have any experience with leather.